Where: Alumni Hall, Annapolis, Md. The storied Army vs. Navy rivalry hits the hardwood Saturday in two nationally televised games at the Naval Academy’s Alumni Hall. While the basketball incarnation may lack the luster of the gridiron version, both the men’s and women’s teams are just a couple games into the meat of their Patriot League schedule, and the rivalry should prove a springboard for the rest of the season. The schools’ women’s teams will play at noon, followed by the men’s teams at 2:30. Army: Junior forward Ella Ellis leads the Black Knights with close to 18 points and 5 rebounds a game. 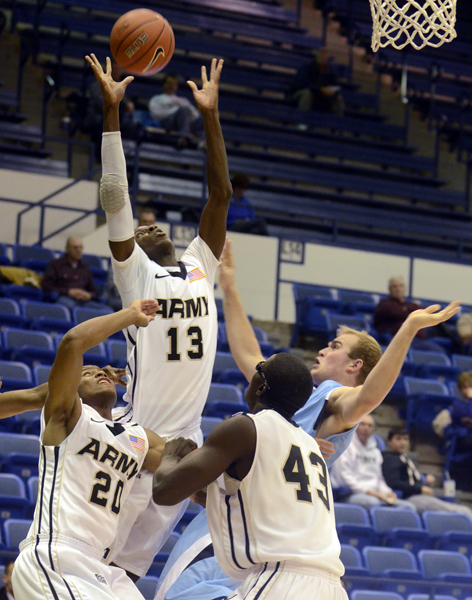 The team is banking on success from beyond the arc to stay competitive; roughly a third of Army’s scoring comes from 3-point range. Army has been averaging 14 assists a game, No. 1 in the Patriot League. The Black Knights are 0-2 in the Patriot League, losing to Bucknell and Lafayette. Navy: The Mids’ disappointing 3-13 start has coincided with a scoring dropoff from senior guard Jordan Sugars. Sugars is averaging 11 points a game, five less than his average in 2010-11. But the Mids’ real Achilles’ heel is their inability to finish games strong: the team is 2-9 in games decided by single digits, and 0-4 in games decided by four points or less. Navy is 0-2 in the Patriot League, losing to Lafayette and Holy Cross. Army: Sophomore guard/forward Jen Hazlett and junior guard Anna Simmers, Army’s two leading scorers, scored 19 and 27 respectively during Army’s win over Bucknell in its Patriot League opener. Army also won its next game, beating Lafayette 44-43 on a layup by senior Meagan Doucette with six seconds left. The two wins kept Army atop the league standings, and Simmers was named the Patriot League player of the week. Navy: The Mids have opened their Patriot League schedule 1-1, edging Lafayette 60-55, then losing to Holy Cross, 55-38. The team has a young nucleus led by sophomore forwards Audrey Bauer (11.3 ppg, 4.9 rpg) and Jade Geif (10.4 ppg, 8 rpg), and is tops in the Patriot League in rebounding, 3-point percentage and scoring defense.